The Amazing World of Gumball Goes Medieval! Hear ye, hear ye! 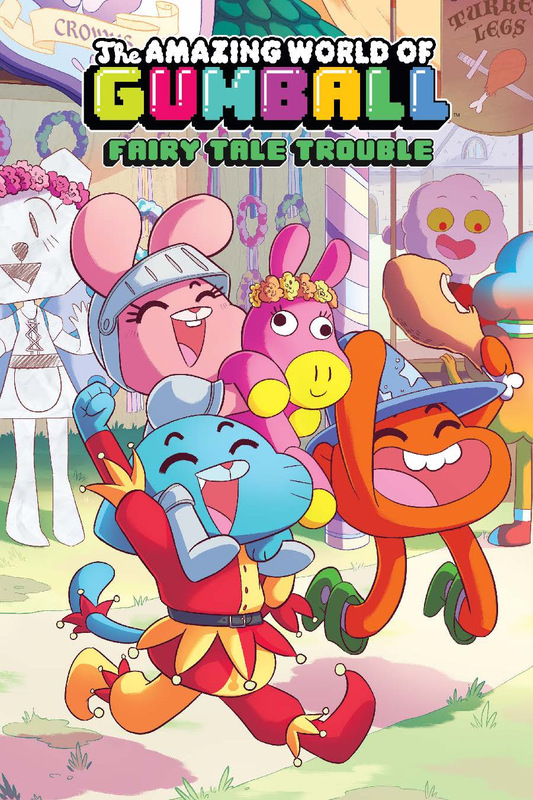 The town of Elmore has always been home to wacky adventures, but this November, things get downright magical in The Amazing World of Gumball: Fairy Tale Trouble, the very first original graphic novel about Gumball and his pals coming from KaBOOM!, the award-winning all-ages imprint of publisher BOOM! Studios, and Cartoon Network Enterprises, the licensing and merchandising arm of the network. The creative team of Megan Brennan (Peanuts: A Tribute to Charles M. Schulz) and Katy Farina (Adventure Time) dive into the mixed-media world of The Amazing World of Gumball for this full-length story starring Gumball, Darwin, and Anais, with a back-up story by Jeremy Lawson (Prez). It’s a beautiful day for a Renaissance Faire, and the Watterson family is having a blast taking in ye olde fun and games…until a magician’s illusion turns into a real spell, and all of Elmore is cast into a fairy-tale world of quests, danger, and magical adventures! Can Wizard Darwin, Knight Anais, and Jester Gumball save Richard from his everlasting, turkey-leg-induced sleep, or will the citizens of Elmore remain trapped in the Middle Ages forever? Created by Ben Bocquelet and produced by Cartoon Network Development Studio Europe, The Amazing World of Gumball has received high critical praise since its debut in 2011, having won several British Academy Children’s Awards and earning nominations in the Annie Awards. The Amazing World of Gumball: Fairy Tale Trouble original graphic novel (6″ x 9″, 160 pages, full color, softcover) arrives in comic shops on November 25th and in bookstores December 1st with a cover by Katy Farina for the price of $14.99 under Diamond order code SEP151123 and ISBN 978-1-60886-744-8. The Final Order Cutoff deadline for comic shop retailers is November 2nd. Not sure where to find your nearest one? Use comicshoplocator.com or findacomicshop.com to find one! It’s also available for order directly from boom-studios.com.